Reading aloud is a staple in our learning environment. It’s not only about me reading to the girls, but it is also about the girls reading aloud too. I learned early on that in order for them to better develop their speech and for me to able to correct any mispronunciations we would have to make sure that they continued to read aloud. 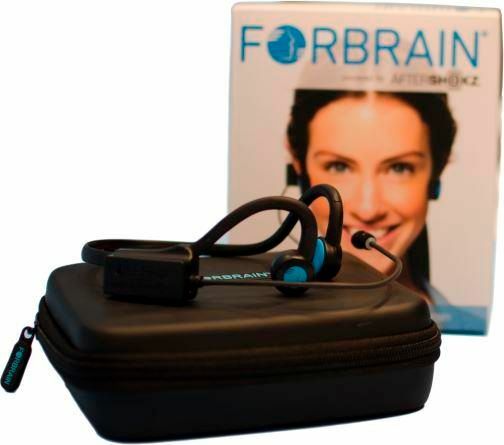 This is one perk of home educating because they receive ample opportunities to speak which came in handy for my youngest daughter to use Forbrain - Sound For Life Ltd.
Forbrain is a headset which wraps around the back of the head with bone conduction transducers which sit on the outside of the ears. The headset has an attached high quality microphone which amplifies the voice to allow the speaker to hear her voice as she speaks. The headset is simple to set up. When we initially received, Forbrain I charged it using our computer and the accompanying USB cord until it was fully charged. It is recommended that it should be fully charged before the first usage. After charging, I allowed both of my daughters to give it a try although the primary reason for deciding to use the product was to help my youngest daughter. I noticed that Forbrain was simple to adjust for either of my daughters since it is already set to the recommended volume, and the headset and microphone are extremely flexible yet sturdy. Our purpose for using the Forbrain headset was to help the youngest boost her reading aloud confidence, fluency, and pronunciation. She often loses track of what she is reading which affects her pacing. Forbrain doesn’t necessarily help with tracking, but it does help with being more focused which I noticed when we read the daily history lessons. She would be become more intentional when wearing the headset which helped with her overall reading skills. My youngest daughter does a great job with decoding, and she comprehends everything she reads. I think this is pretty amazing since she has always showed some similar signs of dyslexia. She continues to reverse and see things differently, but if I hadn’t been with her all along and was simply an onlooker those similarities would not jump out to me as a red flag because she has strong skills in other literacy areas. When I read about the goal of Forbrain which is to boost the brain with your voice, I knew that this may be a great resource for her since she would often attempt to rush through words while reading without decoding. This desire to rush wasn’t because she couldn’t decode, but instead because she didn’t want to take the time to do it. As I mentioned before Forbrain, helped her to slow down so this also helped her to better pronounce many words that she would attempt to skip over in previous attempts. I really do think there has been a boost of confidence when it comes to her reading aloud skills. I say this because she has mentioned that her older sister reads aloud better than she does so I know that she noticed a difference. Overall, we enjoy Forbrain . It is simple to use, and it doesn’t require much to set it up. My daughter uses it daily for about 20 or more minutes although it is only required to be used for 15 minutes per day for children her age. Our history and reading lessons are typically longer so she wears it for the duration of whichever lesson she is wearing it for which is typically longer than 15 minutes. Forbrain doesn’t it sell itself on being a miracle tool, but I can say that this unique device does get something moving in the brain to help correct pronunciation and focus. I really have noticed a different in my daughter’s reading over the six weeks we have been using therefore we will continue to use it.